How the Peterborough Evening Telegraph reported on Andy Furnell's miss at Spurs. One of the Peterborough United players enshrined in the club’s FA Cup folkore has urged the current squad to make the most of their shot at glory. Local boy Andy Furnell’s Posh career only stretched to 23 appearances and one goal which was a big disappointment to those who saw the potential in a gifted and fearless striker. Rival managers at the 1994 FA Cup tie between Spurs and Liverpool, Ossie Ardiles (left) and Chris Turner. Furnell could play. 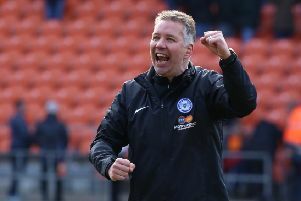 He made his debut in the old First Division and didn’t look out of place, but injuries caught up with him and he left Posh in 1995 to forge a successful career in non-league football. But mention Furnell to Posh fans of a certain vintage and a momentous 1994 FA Cup replay at White Hart Lane against a top-flight Spurs side managed by club legend Ossie Ardiles will immediately spring to mind. A Posh side destined for relegation were five minutes away from winning the first game in front of a packed London Road crowd when Jason Dozzell equalised Jason Brissett’s goal. Spurs took an early lead through Nicky Barmby in the replay, but Ken Charlery soon levelled and the teams couldn’t be separated for the rest of the match and 30 minutes of extra-time. Ken Charlery (right) equalises for Posh at White Hart Lane. Furnell was just 16 and came on at half-time. He was among the first to volunteer to take a penalty in the shoot-out. “I was fearless at that age,” Furnell recalled when speaking to the Peterborough Telegraph this week. “I wanted to be a hero, but it didn’t quite work out that way for me. “I took the fourth penalty, but Ian Walker guessed right and made the save. We lost the shoot-out 5-4. “I suppose it took bottle to take one, but I didn’t feel great after missing. The players, the fans and manager Chris Turner were great though. They were very supportive. “We were struggling in the league at the time so it just goes to show what is possible in the FA Cup. I was in the squad for the first tie, but didn’t make the bench so I was delighted just to be a substitute for the replay. “We fancied our chances because we had played well in the first game. I came on for Dominic Iorfa and I enjoyed it. We played well again and had some chances to win before the shoot-out. “People still talk about the replay and my penalty. I work in Northampton now and it still comes up in conversation. “I fancy Posh have a chance against Leicester. I’d advise them to play on the front foot and have a real go at them. You don’t know what team Leicester will turn up with, but the Premier League squads are so big now even a reserve team should beat Peterborough. Furnell is 40 now and managing his local team Yaxley FC in the United Counties League. Posh replay team: Barber, McDonald, Greenman, Howarth, Welsh, McGlashan, Kruszyinski, Adcock, Charlery, Iorfa, Brissett. Subs used: Furnell, Spearing. Spurs replay team: Walker; Austin, Edinburgh; Samways, Calderwood, Sedgley; Barmby, Hazard, Anderton, Caskey, Campbell. Sub used: Kerslake.